The Italian troops stay between Agedabia and El-Agheila. In Libya, the British are victorious at Beda Fomm; 20,000 troops of the Italian Tenth Army surrender. General Graziani ask Mussolini for substitution as a commander of the Italian forces at North Africa, and as Libyan Governor. After just over 2 weeks of frenetic action, Rommel’s counter-offensive comes to a halt in front of the Gazala line, a series of self supporting fortified boxes running south from Gazala for 100 miles to Bir Hacheim. Although not complete, it presents too much of an obstacle for the Afrika Korps who by this time are running low on fuel and reserves. Lt. General Percival, the commander at Singapore, says city will be held to the last man. The Japanese launch a feint landing on Pulua Ubin Island to the east of Singapore. 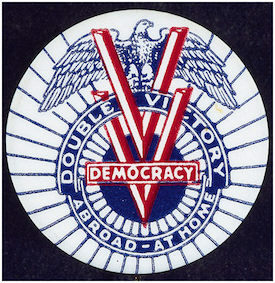 “Double V” campaign proposed by Pittsburgh Courier, the leading black newspaper, to fight for victory at home and abroad. US Navy Atlantic Fleet Anti-Submarine Warfare Unit established at Boston, MA, under Capt. Wilder Baker. Shoe rationing begins in the USA, limiting civilians to three pairs of leather shoes per year. 802nd Medical Air Evacuation Transport Squadron embarks from New York for Algeria on USS Lyon. The first operational ‘Schnorkel’ U-boat arrives in the Atlantic. The Germans begin a full-scale counter-attack against the Anzio Beachhead. Russian attacks north of Konigsberg are blocked with the help of naval gunfire by the cruisers Scheer and Lutzow. 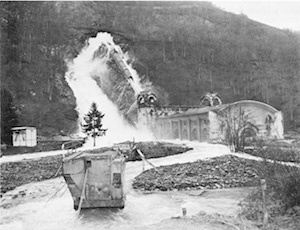 The Germans blow up the floodgates in the Ruhr, flooding the area West of Cologne and preventing the use of assault floating bridges by Allies. Paraguay declared war on Germany and Japan. The 2nd Ukrainian Front captured the southern rail station at Buda, Hungary.